A fable of a young boy who is coming of age in the most peculiar of circumstances. Tonight is the very first time his Papa and Grandpa are taking him to work. In an old wooden boat, that's called "la luna", they row far out to sea, and with no land in sight, they stop and wait. A big surprise awaits the little boy as he discovers his family's most unusual line of work. Should he follow the example of his Papa or his Grandpa? Will he be able to find his own way in the midst of their conflicting opinions and timeworn traditions? Nominated for Academy Award (Oscar) best short films of the year in Animation. 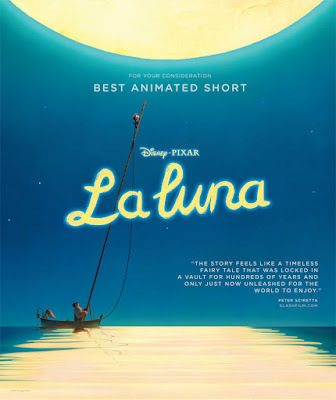 La Luna - Little Bambino is excited when his father and grandfather decide to teach him their family vacation and take him to work with them. But soon his excitement turns into confusion and conflict.